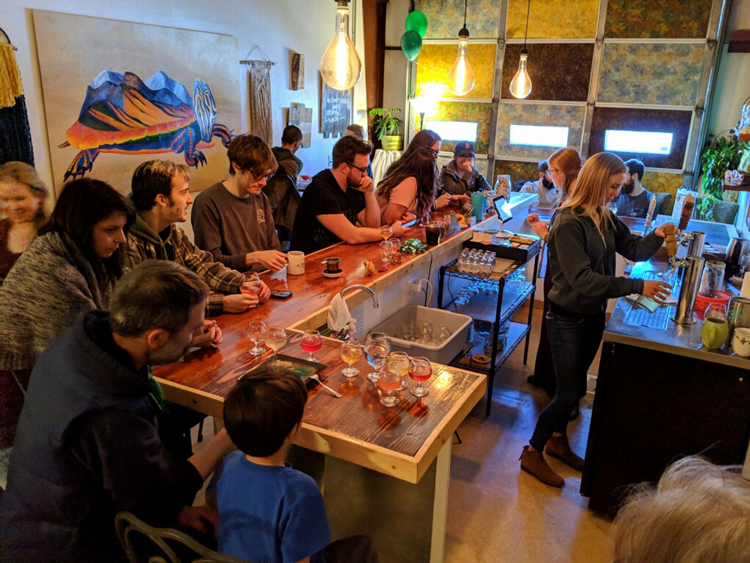 In March 2018, Turtle Mountain Fermentery opened their nonalcoholic, kombucha taproom and brought the first business of its kind to Fort Collins. Now, with five years of operation under their belts and one full year in the taproom, sisters and co-owners Natalie and Hannah DiSanto are settling into the small business community—and the brewing industry—of Fort Collins. “We’re proud of our entrepreneurs here,” Natalie added. We sat down with Natalie, Hannah and Natalie’s baby boy, Everett, to learn about their story and to find out what it means to be a kombucha brewery in Fort Collins. A woman with many hobbies and passions, Natalie has been brewing her own kombucha for years and drinking it because she loves it. “It just makes me feel good,” she said. 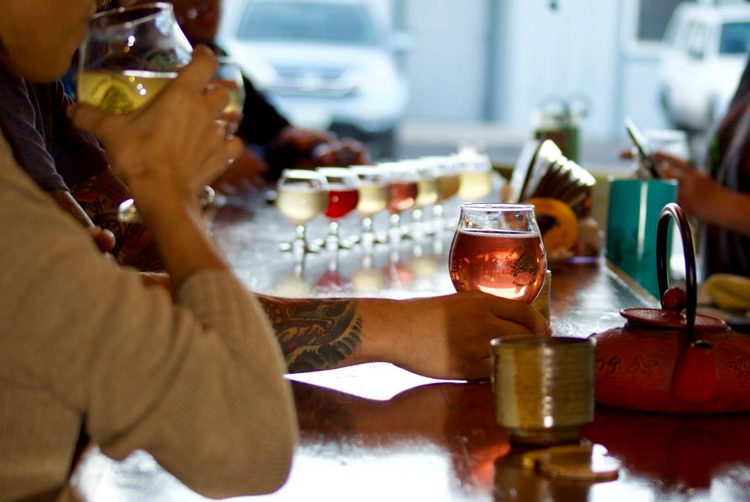 Today, the sisters operate a fully non-alcoholic bar-meets-tea house where anyone—no matter their kombucha experience or age—can try fresh kombucha, sip hot, house-blended tea, study in the taproom, hang out with friends, snack on fermented foods, and support local business. Kombucha itself has become extremely trendy in recent years. You may recognize it from grocery store shelves or from the fridge of your health-obsessed cousin, but at Turtle Mountain, Natalie and Hannah are working to make it more approachable and much tastier. 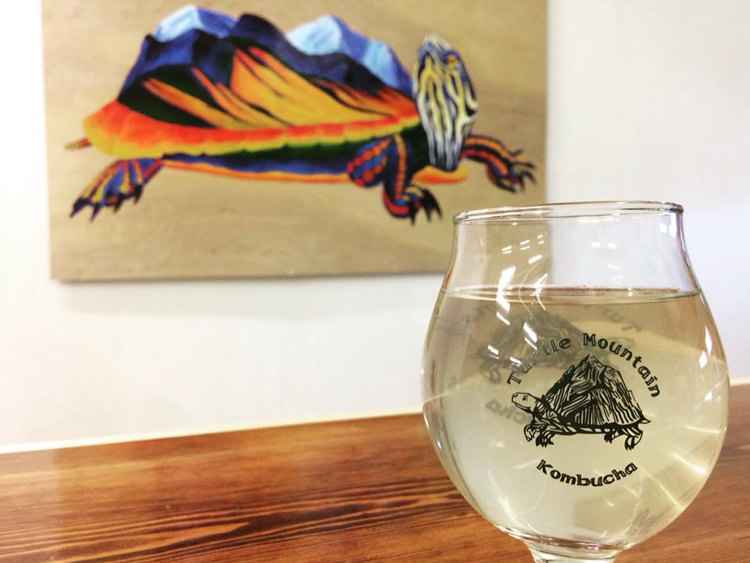 In addition to using whole fruits and vegetables, organic juices and organic herbs to infuse their kombucha, there’s one other important factor that sets Turtle Mountain apart from other kombucha businesses. Turtle Mountain can be found in several locations throughout Fort Collins, Loveland and the Front Range. So whether you make it into the taproom or you’re visiting a different business in town, there’s a good chance you’ll run into their happy, turtle logo. You can’t miss him—or the mountain on his back. “We’re on tap at Happy Lucky’s Teahouse, Maxline Brewing and Prost,” Hannah said. “You can find bottles at Odell, Horse & Dragon, Snowbank, and Tap and Handle. You can find us in so many places.” Turtle Mountain is also available at the new Lucky’s Market in Fort Collins, at Bean Cycle Roasters in Old Town, and at Beaver’s, Natalie’s first client ever. But if you really want to experience this family-run, hyper-local, small business, we recommend stopping by the taproom. Open Thursday through Sunday, it’s located in the heart of a neighborhood packed with other Fort Collins originals, including Funkwerks, Horse & Dragon Brewing Company, Snowbank Brewing and Odell Brewing Company. You can learn more about Turtle Mountain Fermentery on their website here. You can also follow the team on Facebook and Instagram. And next time you’re sipping Turtle Mountain kombucha, snap a photo and tag #NoCoSpeaks so we can join in the fun!